ORIGINS Eye Doctor Moisture care for skin around eyes 15ml, an eye cream to target crow's feet, dry lines and dark circles under the eye. ORIGINS Eye Doctor soothes and cools the delicate eye area with Cucumber and Rosemary, while Ginseng energises the skin to educe puffiness and minimise the appearance of dark shadows. Antioxidant rich Green Tea Extract fights free radical damage to diminish crow's feet and fine, dry lines. Active Ingredients: Hydrocotyle, Cucumber Extract, Ginseng, Rosemary, Green Tea Extract. Skin Type: All Skin Types. FREE delivery on orders over £50.00. ORIGINS Eye Doctor Moisture care for skin around eyes 15ml was found on 3 websites and was price compared using EAN: 0717334017788. 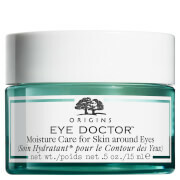 The cheapest ORIGINS Eye Doctor Moisture care for skin around eyes 15ml is shown as the main item, prices range from £32.00 to £31.50, excluding delivery. Price comparison based on price and delivery charges, with any valid discount codes being applied, is shown in the table above. Prices and information correct at the time of publication. Copyright © 2018 spa and salon. All right reserved.